Does your mail man ever get lost? Maybe he should switch from Mapquest to Google Maps. Or you could do it for him—sort of. 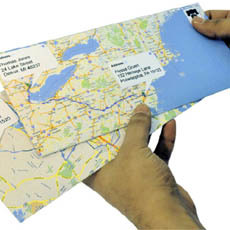 Google Maps envelopes (only a concept at the moment) would let you send snail mail through a button right in gmail and print envelopes showing the route between the two addresses. The only flaw with the design is that the from address would have to be west of the to address, unless the envelope isn’t strictly oriented with North facing up. @Sam, but that would mean the route connecting them cuts off. The better solution would be to flip everything upside and just use a guide showing which way is north. …but how about just making the “tail” of the return address box longer if it has to cross over the front of the envelope? Cool idea, but mail is rarely sent along the most direct route, usually going through mail centres instead. i think a better idea would be to zoom in on the To: address location, so posties know exactly which house to go to. Still, a lovely concept I might adopt myself. Except if the mail is traversing very long distances … in which case this is rather silly. Unless you simply show the address it is to. Uh people, I think it’s just for fun. The post office delivery person will not actually be using the directions. So who cares if it’s not perfect. It’s just supposed to look neat. Hahaha…. How funny that nearly ALL of you think a postman is going to actually use the map. So hilarious!! Thank you so much for making me laugh! I like the idea of East to West ‘crossing’ to the back of the envelope. I always put the return address on the back anyway. This would be great for wedding invitations to show approximately where the wedding is and how far away it is! So much FUN! – not serious – Think this absolutely adorable – especially since my 95 yr old grandfather can’t hear me through the phone and I hand write him letters every couple of weeks to keep him in touch with our family since I don’t get to spend time with him as much as I’d like living 13 hrs from “home”. I bet he’d LOVE to see this! You would also need a printer that can bleed to the edges, otherwise, it wouldn’t look as sharp. Oh you guys are taking this too seriously. They’re just trying to be cute with their words. It’s just a neat envelope…that’s all. This idea would be great in birthday parties and other gathering! Trying to stop a cat﻿ fight is dangerous to your health. You will be mauled like a bear. can’t wait until envelopes are made out of thin display screens so that the postman can zoom in on the map…. I like the concept, not sure of how to fine-tune it. I guess you could do it with the disclaimer “Not geographically accurate” or just put the compass rose on it so people could turn to north. Or, as long as the address bubble is in the correct space, the map route could be anything–you just have to extend the end points to the return address/address side correctly.